Awesome episode Military Dollar and it was great seeing you again in Orlando! Awesome post! May I add a little bit about advantages of transferring post-9/11 GI Bill benefits to dependents? 1) Early Decision – this is the “binding” version of early application (as opposed to “Early Action”) and many people don’t do this because they don’t know what the financial aid package will look like. But Early Decision is a way to get a qualified student a better shot at the limited number of acceptances at high caliber colleges. So parents have a dilemma – do we do Early Decision for junior’s dream college but perhaps not afford it once s/he is in, or do we take our chances with the normal application process knowing that 1,000’s of kids are competing for a few hundred spots in the Freshman class coming up? Having the financing backup of the post 9/11 GI bill gives you some freedom to go Early Decision if junior has one “dream school”. Caution – most private colleges will be more expensive than public so the GI Bill may not cover everything – check to see about “Yellow Ribbon” if available to cover the difference. But if so, gives your kid a leg up. 2) Limited “Yellow Ribbon” – many private schools have only a few “Yellow Ribbon” scholarships – these help make up some or all of the difference between what the GI Bill pays (equal to most expensive state PUBLIC college) and what a private college charges. But if you are Early Decision, you may be able to lock down the Yellow Ribbon at a school that only has a limited number. Sent my kid to Duke University for 4 years for free. She was totally competitive, but Early Decision helped lock it down. 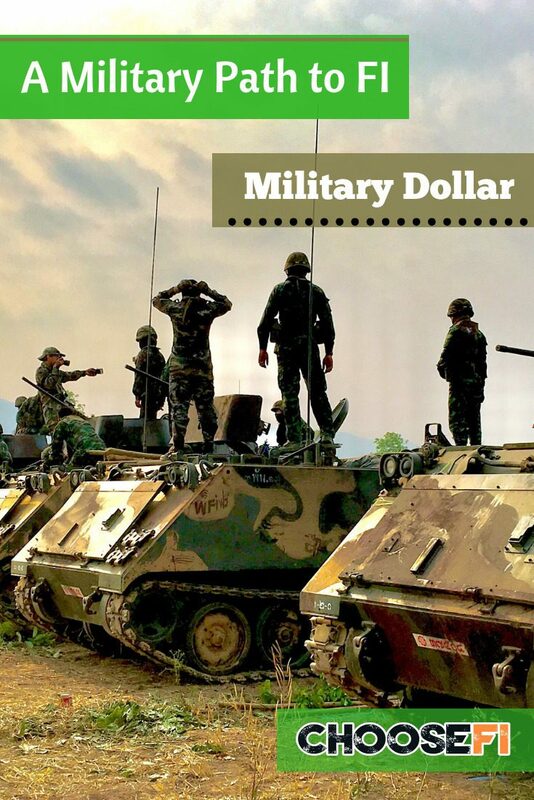 Military Dollar is the best! Thrilled to see her on ChooseFI. Sure wish I knew her and her blog when my husband was still active duty! Hi friend! I also wish that because he’d be even more annoyed when we play CAH ? This didn’t have a whole lot for me, as someone who is not in the military, but the guest was nice. Great episode. I wish you had been around in 1998 when I first enlisted. I agree, back then there was no formal education than a Commander for a 10minute briefing that you were voluntold to attend. As I speak to my children who several have been in the military now, it mostly remains the same. Great episode and insight into the blended TSP vs the traditional TSP. Great breakdown on the GI benefits and taking the multiple ways to get credits while still active.